Les Vachers is a stone built farmhouse dating back to the 16C. The large veranda offers a covered dining area for those lazy barbecues. Both the terrace and pool are floodlit to extend those relaxing evenings outside. The house is spacious with a well equipped updated kitchen with a range style cooker. The two double bedrooms each have their own en suite bathrooms. One of the twin bedded rooms is on the ground floor with a shower room next to it. The farmhouse is in a peaceful location set in 10 hectares of land with a private nine hole pitch and putt course. The south facing pool overlooks the private fishing lake which is well stocked with large carp up to 20lbs. Use of both the golf course and fishing lake are included in your stay at no extra charge. The 18 hole public golf course and leisure complex of Chateau les Vigiers is less than 10 minutes away. This holiday villa with it's private pool is ideal for those family get togethers or groups of friends chilling out. Whether it is making restaurant recommendations or reservations for you, arranging for you to dine under the stars at a local chateau, a pampering session with a local beautician or simply arranging baby sitting we are here to make your holiday truly enjoyable. With the owners being on hand we can organise a range of additional activities or services for you. Fishing: The large well stocked lake offers carp, rud, roach and perch. Carp of up to 20lbs have been caught in the lake. They have been well fed and offer easy fishing for children and fun for all the family. A large hunk of bread on the end of a line is normally all you need. General Information: The summer season in the Dordogne offers hundreds of different events from town to town. Bergerac alone has 10 different events ranging from fireworks on the 14 July to long weekends of wine and food festivals. The local restaurants range from 4 course set lunches with wine at 13 Euros to the 4 star restaurant at Chateau les Vigiers. There is lots of information available and the owner is on hand to give you his personal advice. Wine: Les Vachers is at the heart of the wine growing region. Bordeaux and St Emilion to the west and Bergerac to the north. There are hundreds of wine producing chateaux in the area, many of whom offer free tasting. The owner is on hand to give his advice and to direct you to the award winning vineyards in the area. Sigoules wine festival is in July, lots of stalls offering free tastings. I have lived in France for more than 40 years and adore this very special area of South West France. I have drunk more bottles of wine than I care to remember and enjoy a bottle or two with a good meal. I have an extensive knowledge of the local area and am happy to recommend places to visit, restaurants to try and wine to sample. Les Vachers literally means the cow complex. This farmhouse has been renovated by me to include all the comforts you would expect as well as retaining the character of the building. I make sure the kitchen is fully equipped with everything I would like to find in a kitchen so you can experiment with the local foods in the comfort of your own home. The private pool has steps leading down to the shallow end and a separate kiddies pool making it suitable for everyone. The lake is overlooked by the pool so you an relax by the pool and still be within shouting distance if they catch the big one! Whilst there are many villas with pools, not many come with their own private fishing lake and golf course. I provide clubs including ladies, kids and left handed clubs so everyone can have a go. Will also promise to keep Husky out of the way whilst you are playing. Not many courses have a golf ball eating dog as a hazard! There is a fridge/freezer. There is also an under worktop fridge and another freezer, plenty of space to keep those drinks and ice creams cold. The basics such as cooking oil, condiments and some herbs are provided. Fully equipped kitchen with everything you would like to find. We had a chef stay in the summer of 2014 who loved it and so did his fellow guests. There is a dining table in the kitchen area as well as the outside table on the covered verandah. Private golf course on site included in rental rates. The house is well equipped, with all linen and towels for house use provided. The open plan kitchen area has space for indoor dining. Changeover day is Saturday with arrivals from 5pm. A docking station is provided for your i-pod or MP3 player. The owners live locally and are on hand to offer help and advice to make your stay a pleasant one. We were a group of six adults, who very much enjoyed our stay at Thénac. The house was well equipped, in a lovely rural setting and the owners Alan and Sandra live close by and were always available to offer advice and solve the minor issues we had.The surrounding scenery including the lake was very attractive and we enjoyed visiting local towns of interest. 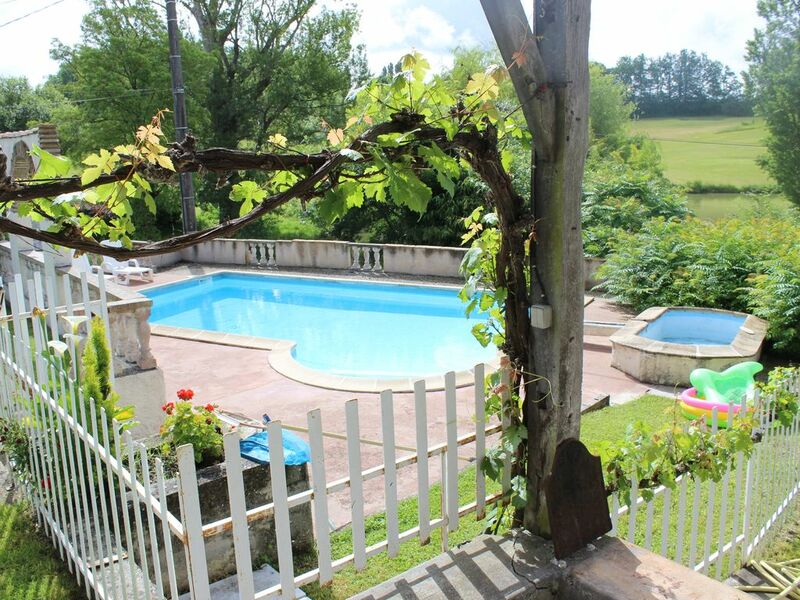 Rustic accommodation with good outside space and facilities, in quiet part of rural France. We had a very relaxing stay and the owners were extremely helpful. Family of 6 including adult children looking for peace and quiet but perhaps a little too far away from good local restaurants etc for the young people. Car essential but there are good amenities within 15 minutes drive. The accommodation is spacious, but quite rustic, and has somewhat idiosyncratic plumbing upstairs. Good sized kitchen with all the necessary appliances. Wi-fi a little unreliable and not available in the house itself. Husband thoroughly enjoyed the access to fishing; cycling challenging but enjoyable for the exercise fanatics in the family and pitch and putt was diverting but watch out for snakes! Pool of a good size but if the weather is very hot (as it was while we were there) some parasols would be a welcome addition to provide shade. A wonderful area - picture-postcard scenery with rolling hills, vinyards and woods. The house is part of a small hamlet but very much tucked away. Alan and Sandra excellent hosts with lots of good suggestions for things to do in the area. Golf was great fun. Perfect for all standards - and all the more enjoyable for having our private course. And the fishing - you actually catch fish... big ones! A beautiful farmhouse situated in an amazing setting. The holiday as a whole was one we will never forget - it was beautiful! The farmhouse was located in the most idyllic setting, overlooking the private pool, golf course and fishing lake. On arrival we were welcomed by Sandra and Alan who were both lovely. They showed us round and offered help and advice on places to visit etc, and throughout our stay they were on hand if you needed anything. The house itself had everything that you could possibly need, (and more). The location of the house is in a quiet, peaceful setting, but is not too far away from small towns, the supermarket, and other local attractions. However a car is essential. We would certainly, without any hesitation, book to stay here again. We had an amazing time and we now hope that one day soon we too could have a place in France of our own. Thank you Alan and Sandra ! Characterful property away from the hustle and bustle of life! The hosts were fantastic! Enchanting, spacious accommodation, had all the facilities a family or group could want. Although a little isolated it gave us the peace and tranquillity that we were looking for. The pool was a good size and the fishing and golf were an added bonus. Alan and Sandra were the perfect hosts, friendly and very helpful, booking restaurants and recommending places to visit. We thoroughly enjoyed the daily visits from the two dogs!. A delightful holiday and would not hesitate recommending to others. Les Vachers is 20km south of Bergerac set amongst local vineyards. Bergerac offers low cost flights from a variety of UK airports with Ryanair, Flybe and Jet2. Bordeaux airport is 1 hour away. A car is essential in this rural area. Bergerac and Ste Foy La Grande are the 2 main market towns. Bergerac has a wine museum on the river front which is well worth a visit and combine that with a boat trip along the Dordogne river. The pretty bastide town of Eymet is also nearby hosting both a weekly market and in the summer months a night market. Duras with its imposing chateau is only 20 minutes drive and again has a wonderful night market with music and various food stalls. There is plenty to explore in this beautiful area with canoeing down the Dordogne offering spectacular views. The famous wine region of St Emilion is only 40 minutes drive away and this picturesque town is well worth a visit. With so many restaurants in the local area you are spoilt for choice. There are 3 course set lunches from as little as 12 euros per head to the Michelin starred La Tour des Vents at nearby Monbazillac. Golf: A private 9 hole pitch and putt course is set in the surrounding grounds, with the lake being a water hazard! Most holes are a par three with a couple of par 4s so those kids (and big kids) can play while Mum relaxes by the private pool. A full range of golf clubs are available for your use during your stay at no extra charge. Ladies clubs, left handed ones and even kiddies clubs are available so no excuses. Chateau les Vigiers is a golf and leisure complex which is only 7km from Les Vachers. It offers a 18 hole golf course and driving range. There is also a 6 hole academy course. Visitors are welcome and golfers with minimum 36 handicap can play, with clubs, trolleys and electric carts for hire. The chateau also offers 2 restaurants and a beauty salon. There are many other courses in the vicinity, the owner can give directions. The property may be available at other times - please contact the owners to check. There is no additional charge for golf on the pitch and putt course, it is included in the rental rates, as is the fishing. A deposit of £200 per week is required on booking. The balance payable 6 weeks prior to arrival date.